Australia is a wonderful country but it is far from the rest of the world. So as a direct consequence the flight tickets to Melbourne are not cheap. You need to pay the price to be able to see this stunning city and its surroundings. However if you follow some of my tips you may be able to find cheap fares even for the peak period like what I did last Christmas. Ok I know that I said I did manage to find great deals during Christmas but you have more chance to find cheap flights if you avoid peak periods. And something I learnt since I am in Australia is: Do not expect to get "Last minute deals", you need to book early to come to Australia. It is also true for Domestic flights because Australians like booking very early for their holidays. To find a cheap flight to Melbourne you have to start shopping around early. October to February is the main tourist season for Melbourne and the other cities in the southern side of Australia, and is the time with the most expensive flights. Christmas/January During Christmas and the summer holiday period the prices are just ridiculous. If you want to fly around that time book very early! Public holidays weekends are usually very busy. Avoid also if you can some dates around the major events like Melbourne Cup, Australian Open and Melbourne Grand Prix. I have travelled with all the above airlines and they are all great airlines, so if you can find a cheap flight to Melbourne with any of the above airlines, Go for it! Or register yourself to their newsletters and wait for their sales. I know Qatar my favourite airline do usually 2 sales per year and you can get some awesome deals. I have tested Air New Zealand and Chinese Southern. Their service are slightly under the top group but I had good experience and I thought they are good value for money. Chinese Southern has recently increased the number of flights from Melbourne to Asia and Europe. So more chance for you to find a good deal. I know there are plenty of online flight comparators but Skyscanner is the best. It compares millions of flights to find you the cheapest deals very fast. You can use the online website or install their application on your smart phone. When you find your flights and click to book, Skyscanner also links you through directly to the airline or travel agent. To find the best deal you can even try Skyscanner in different part of the world. For example: Skyscanner.ie may give you a better deal that Skyscanner.com for the same flight. Do not ask me why, it is only my observation. I know most of people will tell you to book online to find cheap flights to Melbourne Australia. Which Airline should I choose for Domestic Flights? Qantas "The flying kangaroo" is an Australian icon. Qantas has of course the most options and packages that combine international with Australian domestic flights. But unless you are very lucky you will not find the cheapest fare with them. 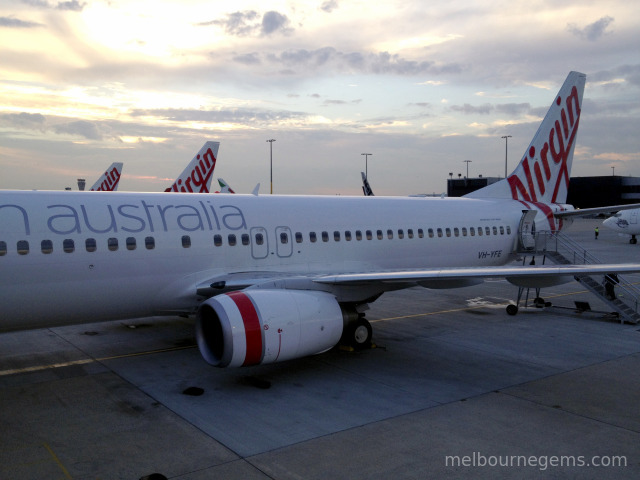 I book most of my domestic flights with either Virgin or Jetsar. They are good value for money and they both have an extensive domestic network. So do not forget to subscribe to their newsletter to grab one of the special offers on time. Most of the airlines will only use Melbourne Tullamarine airport but Jetstar also has flights to Avalon airport. You may have a better chance to find cheap flights to Melbourne if you choose to fly Avalon airport. Avalon Airport is located 55 kilometres from the Melbourne CBD and is an easy, 40-minute, toll free drive from the CBD. Avalon is only 20 km from Geelong (the 2nd biggest city in Victoria) and is a good departing point if you want to go to the Great Ocean Road. There is also a bus to take you to Melbourne CBD for a trip of approximately 1h. As you can see this airport is only slightly further than the main airport. So it may be a good idea to take this option of you can find a great deal. Not a lot of people know about this airline. REX is an independent regional airline. Their planes are not very big and REX will not be your first choice if you come from one big city.